Over 80% of the training exercises at Elite Sports Performance can help you excel as an athlete, no matter what your sport. The staff at Elite Sports Performance has a goal, and that is to help YOU reach YOUR goal. We can adapt our programs to meet your individual needs no matter what sport you play. Baseball: Boost your strength, speed & flexibility so you can hit farther, throw harder, and run faster. Basketball: Run faster and longer, jump higher and sink those winning shots by increasing your speed, endurance and agility. Field Hockey: Powerful passing and strong bursts of speed will give you the winning edge. Football: Agility. Strength. Power. Power. Power. Golf: Learn how to increase your balance, swing power, and accuracy. Hockey: Lower body strength for speed, upper body strength for powerful shots. Lacrosse: Increase your agility and speed to stay two steps ahead of your opponent. Rugby: This demanding game requires very high levels of speed, strength and power. Running: Programs for runners striving to increase speed and endurance. Skiing: Downhill, Cross Country, Snowboarding… Different types of skiers need different training programs. We will target your individual needs. Soccer: Stamina is key. Increase your strength and endurance to stay in the game. Softball: Don’t underestimate the effect that increased strength and speed will have on your game. Tennis: Hit every shot harder and with more accuracy, with strength and agility training. 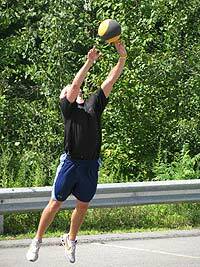 Volleyball: Lower body strength will help you jump higher. Agility training will help you hit more winning shots. Wrestling: Learn how to increase strength and muscle endurance with minimal weight gain.